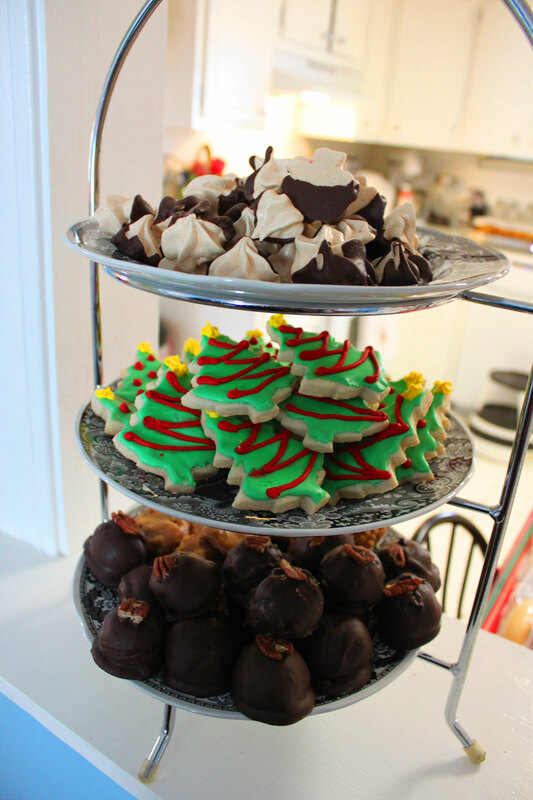 These are the gluten-free Christmas goodies I made for our after-Christmas-pageant family dinner. Chocolate-covered peppermint meringues, roll-out sugar cookies (from the book 100 Best Gluten-Free Recipes), pralines, and chocolate-covered bourbon balls. I made chocolate-chip and oatmeal scotchies for the gluten-eaters among us, too. 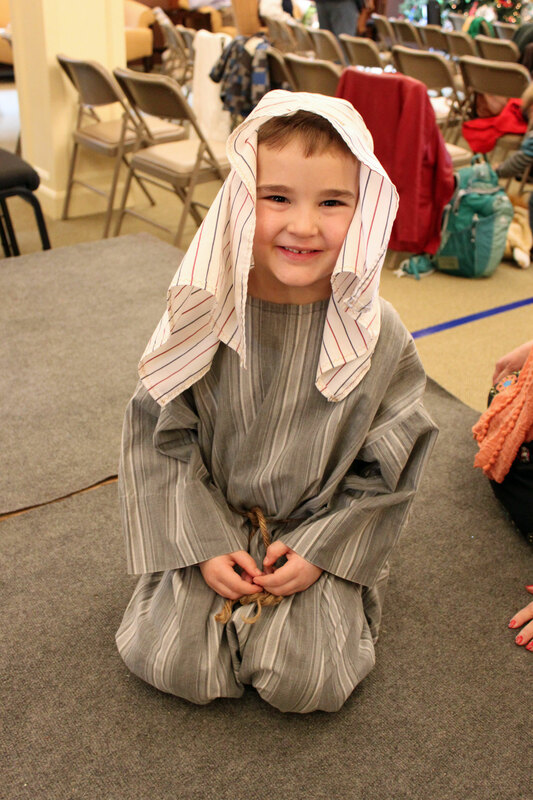 Here is a picture of my little shepherd right before the pageant. He had one line and took it very seriously. 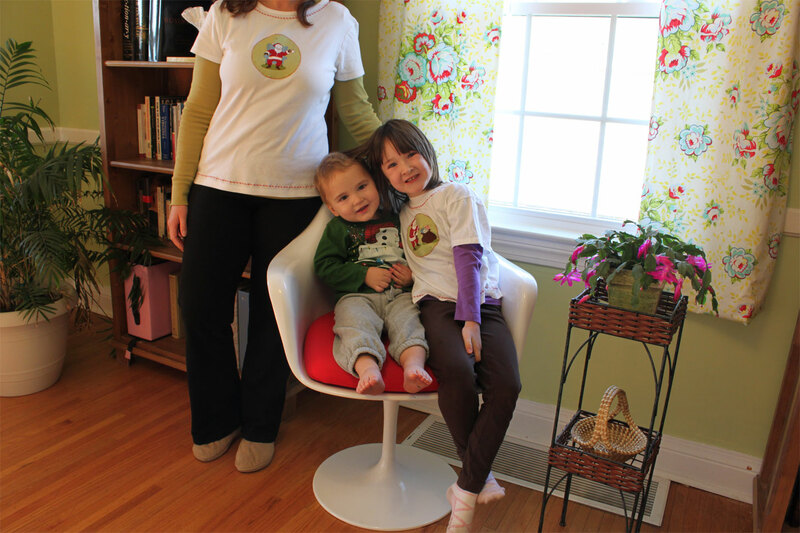 His big sister was one of the star narrators and I was proud of them both. 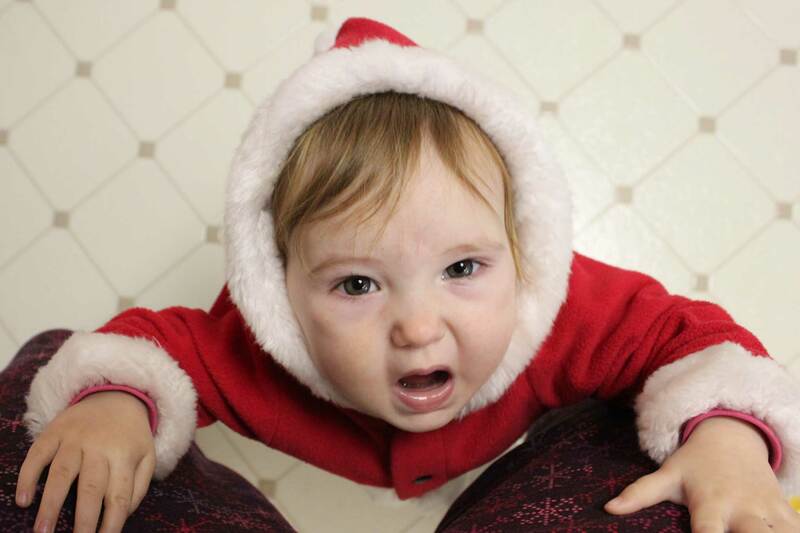 And my little Santa Baby in the same fleece Santa suit both my other children wore. She’s just a meme waiting to happen, don’t you think? This picture is what you get when you set the camera on something, focus on your children, hit the timer, then jump in yourself. Oops! I really do have a head–it just didn’t make it into this photo. Anyway, the point of this photo is the matching Santa t-shirts I made for Dorothy and me. I cut out round scraps from fabric left over from the pillow project (below), a coffee-drinking Santa for myself and a stocking-stuffing Santa for Dorothy. I ironed them onto the shirts with Wonder-Under and zigzagged around the edge in red. Also with the red thread I did decorative machine stitching around the neck and bottom hem of the shirts. I paid $2 for my like-new, name-brand cotton shirt at a thrift store and $.50 for Dorothy’s from the same place. Not bad! Now the sad thing about making a t-shirt for Dorothy is that it was going to end up going into her closet, which is often a Horrifying Pit of Filth and Stuff, kind of like the rest of her room only worse. Housekeeping is not a talent of my five-year-old, but unfortunately hoarding does seem to be. One of the problems has been that she really hasn’t had enough drawers for folded clothing items. She has one vintage chest-of-drawers my Mom refinished before she was born, but it has very shallow drawers that won’t begin to accommodate the piles of accessories she accumulates. We were keeping skirts and pants in labeled kitty-litter buckets similar to these but as she got larger her clothing got larger too, and suddenly not very many pants would actually fit into a bucket at all, so they were mostly getting thrown in the direction of the buckets, spilling out, then mingling with doll clothes, dirty clothes, cat hair and who-knows-what-else on the floor. 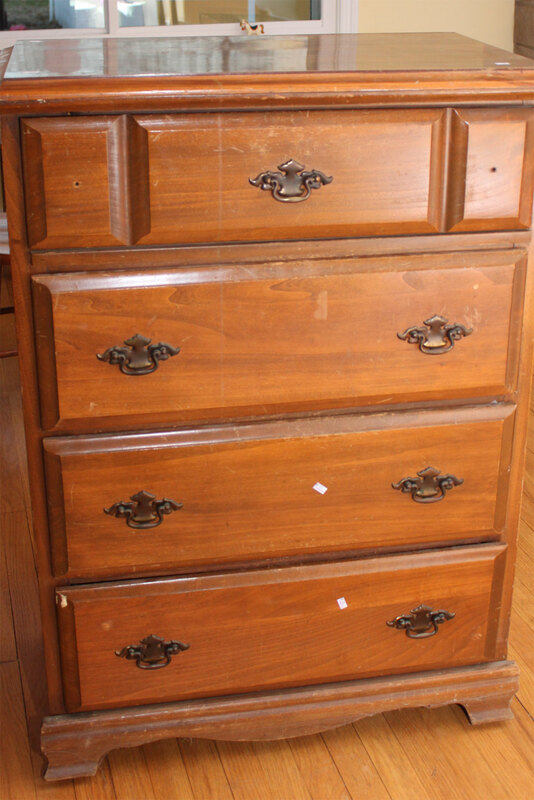 I got completely fed up with the situation all at once last week, drove to the nearest Goodwill, and promptly bought an old wooden dresser for $15. The drawers didn’t fit in quite right but I figured I’d see what I could do–I wasn’t making more than one stop. The problem with the drawers ended up being that they weren’t in the right slots–easy fix! I sanded the whole piece, used leftover wall paint to make it a cheery yellow that coordinates with Dorothy’s beloved wallpaper, and sprayed the old handles white. I did need to purchase new knobs for the top because they were missing entirely, so I bought cute glass ones that look appropriately glamorous. 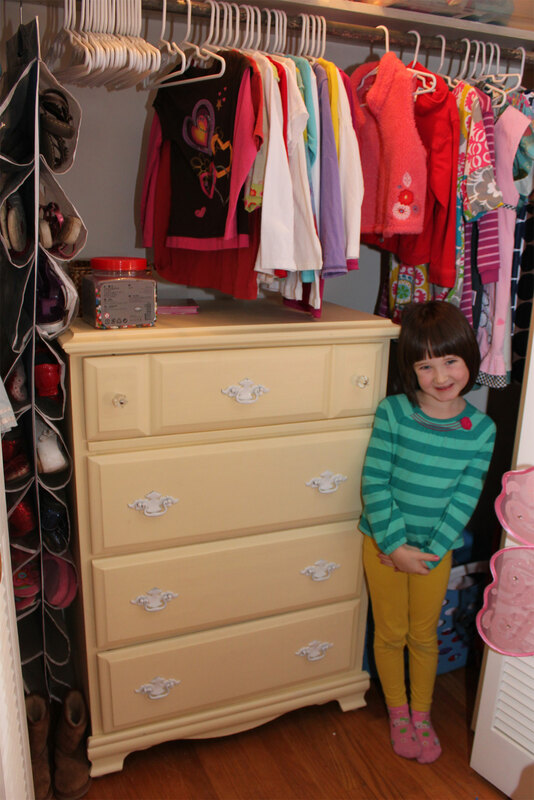 We spent a productive afternoon organizing Dorothy’s things with the help of the roomy new drawers. She loves it and claims to be determined to stick to our new organization plan. I suspect she won’t, but at least now I can chalk her big mess up to her creative spirit instead of a system stacked against her. As an update to an old post, we had a good thing happen in our family this week! Rob, who had been on crutches since he ruptured his Achilles tendon in September, is finally able to hobble around on his boot but without the crutches. He missed being able to drag the dresser downstairs to my work space and then upstairs to our daughter’s second-floor bedroom, but by the next time I drag home used furniture he should be much more useful!